Have you brought the chequie my little turtle-dove? Folkestone have! Now you know that I (and other high-minded Rotary p.r. and presstarians (new word – I like it!)) 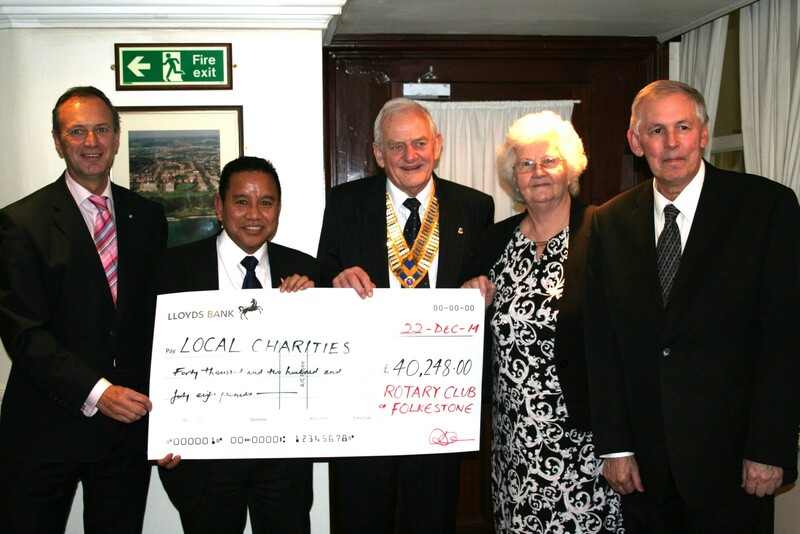 go on about Rotary pix with the large format cheque being supported by three or four pumped-up Rotarians. And yes, sorry folks this is a classic of the genre. But they have a slight excuse…….. not only is the cheque rather large physically, but it also has quite a lot of noughts on it. How much did your club raise last year? £10, thou?, mmm, that’s fairly average/ How about nearly £20, thou? Well people you have really worked hard this year, and what the Polio hunger lunch – oops, I mean frugal meal raised £450, that’s really good. 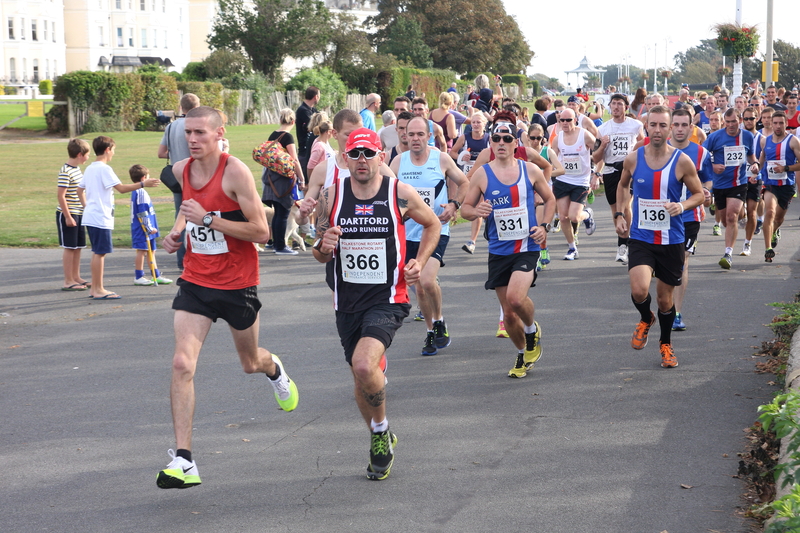 I shall not keep you lot in suspense any longer, RC Folkestone, with their Ninth Half Marathon have raised from this one event – (pause for deep intake of breath) over Forty thousand pounds. And the headline? Enthusiasts for the musical theatre will know it is a quote from the show/film of ‘The Producers’. It is about two shyster theatre producers who, by accident have a huge hit. It is very funny, and, if you are running out of gift ideas this Christmas, you could do worse than the DVD. Perhaps the RC Folkestone Benevolent fund might lend you the money! When opening the photos I thought I was on the set of ‘Doctor Who’, or some post-apocalyptic dystopia of stainless steel and concrete. 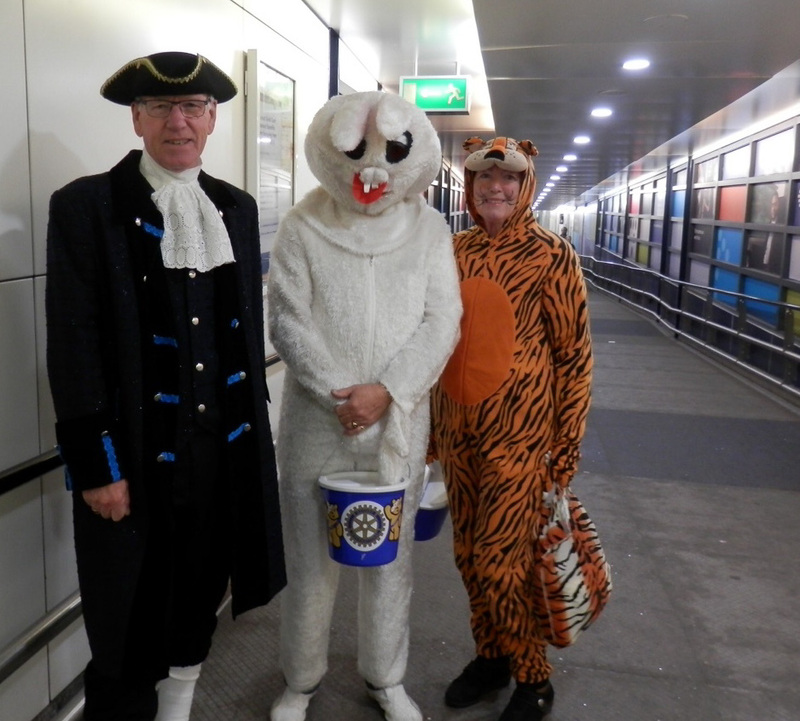 Then the penny dropped – it’s Ashford International Station.
. And the new Ashford Rotakids club, (see 1120 WordPress passim) threw themselves into the fray to ask the residents and commuters to give generously! They did! and the result was a terrific £1,539 from the day, plus another nearly £250 that the Kids had achieved already! A grand total of virtually £1,800 for a day’s work. Exceptional! 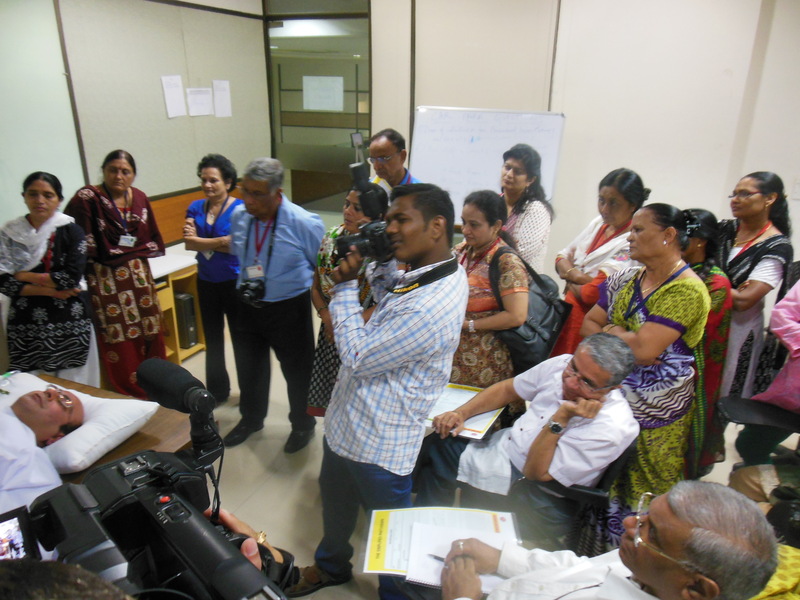 calmed in action 3 – And Kalyan Banerjee Past RI President, is the Cherry on the Cake! And this morning, also bright and early, arrives PRIP Kanyan Bannerjee, President during Lynn Mitchell’s term as DG. He is given the Grand Tour, and is given unsolicited testimonials (by the trainers in training room) on how good they thought the training was.Then onward and upwards, literally, to the second floor for the Press Conference. Having prepared twenty Press Packs, I was quite prepared to be taking some home! In the event fifteen press men turned up, and two or three asked questions. Afterwards, seven microphones and video cameras were in action, so at least around Katchchh, (correct spelling!) we should be getting some coverage on t.v. 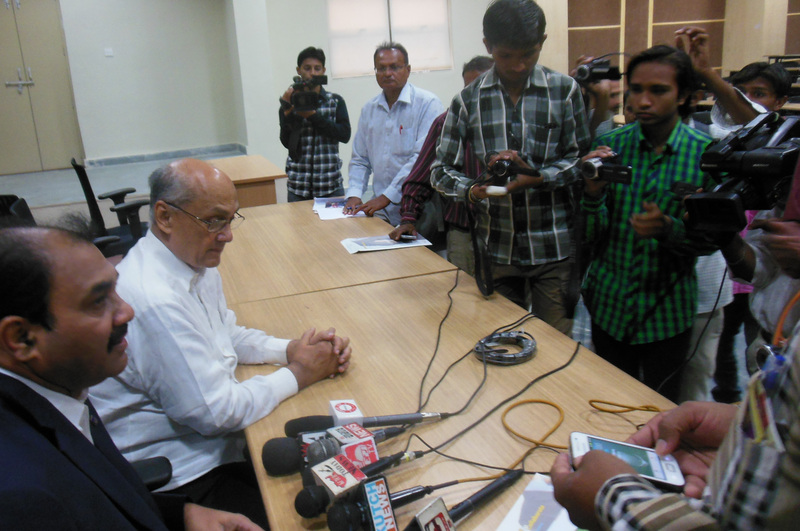 Doctor Rao joined the press conference, and here is a picture of Kanyan answering questions and doing a piece to camera, in Gujurati, with Doctor Rao, the original instigator of this traing period in Bhuj, beside him. And this afternoon, in under an hour’s time, we shall have the final session, with the representatives of the government, who will watch their doctors and nurses receiving their certificates of training. 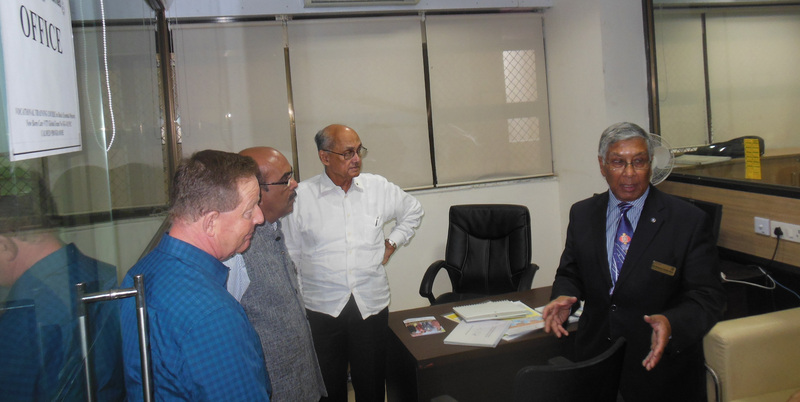 And, apart from a planning meeting on the ‘Way Ahead’ for the possibility of a ‘calmed’ training centre in Bhuj, is virtually the end of the VTT. I like this one that I snapped while the were waiting for the ‘real’ photographer because the class was ‘at ease’, and I think you can see from the picture how relaxed they were after only a few days together. In fact here are both the ‘Master Trainers’ – i.e. the doctors who were on the original course last week, and the Trainers who will be going out ‘to the people’ and passing the techniques they have learned during these few days to the pregnant and delivering mothers who require their assistance. So, although I haven’t done a head-count of the people in the picture there are about sixty-something in total who have drunk at the well of ‘calmed’ during these two weeks. Not only for the large ‘set piece’ training sessions, but also in the ‘breakout’ groups where the trainers have been divided into three groups of ten people, there has been a high level of interest and involvement by the participants in this, the first week of the ‘calmed’ Vocational Training Trip (VTT) enabled by D 1120, & D3051 contributions, matched by a Global Grant by the Rotary Foundation (TRF). 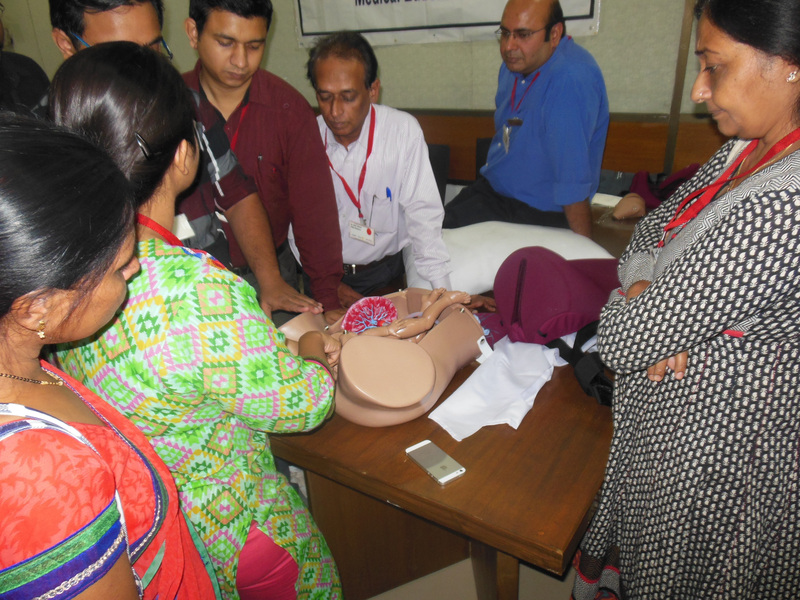 The first part of ‘calmed’ the training of the ‘Master Trainers’ doctors and senior midwives, finished last night. But! they haven’t finished yet! They stay to start the second training session where they are the Trainers for the second level trainers who will be in the rural health clinics and bringing the processes and methods they have learned this week to the people. Hi people meet Harry, Rotakids Pres. for D 1120’s second Rotakids Club…. and he’s got a lot to say! 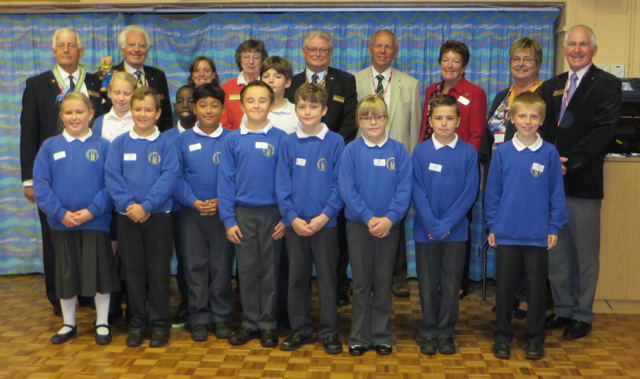 This District’s second Rotakids Club is in St. Mary’s C of E Primary School, Ashford. By the way, that’s Harry in the picture in the blue sweater. 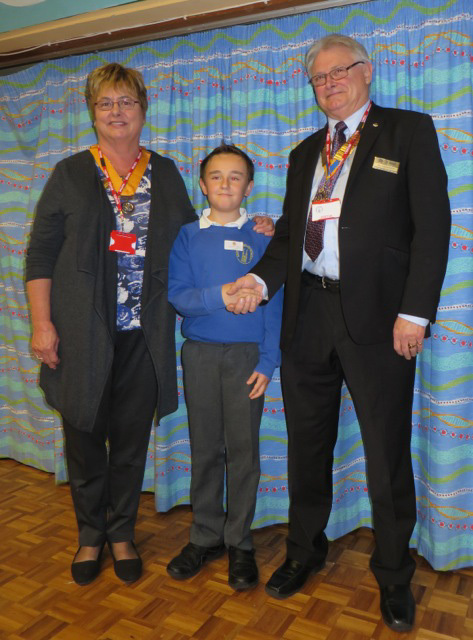 He approached RC Ashford with the proposal to start a new ‘after-school’ group in the name of Rotary, and so they did! 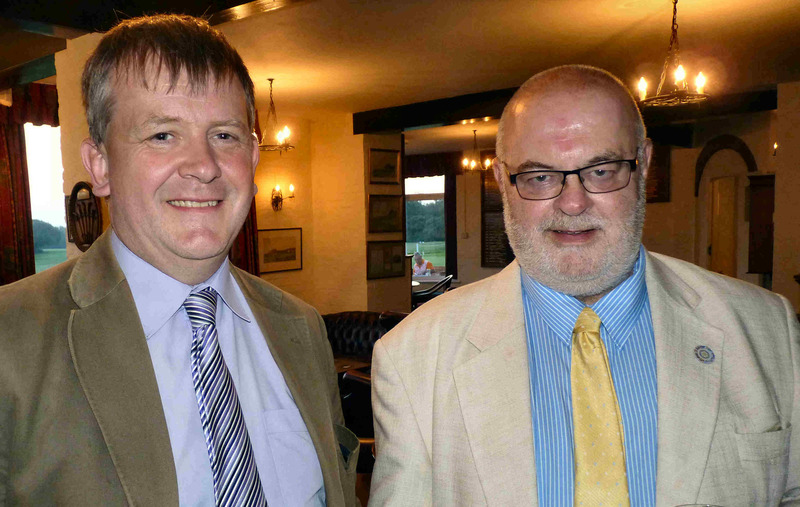 The Rotarian on the right is RC Ashford club President Ian Alexander, and on the 20th. October at a ‘special’ school assembly 12 members were inducted to form the new club, in his, and AG Don Soppit’s presence, and with a congratulatory letter from DG Martin. I assume the lady on the right is the Headmistress, but, sadly, I` don’t have her name. Harry added -” I feel great being President of Rotakids, I like to help poor people feel better and have fun. Maybe one day we will be on TV!” Now there’s someone who knows where he is going, Harry, I feel sure you will. The rest of us – Watch out, Harry and his club of 12 are in vertical take-off mode, and they are on their way! 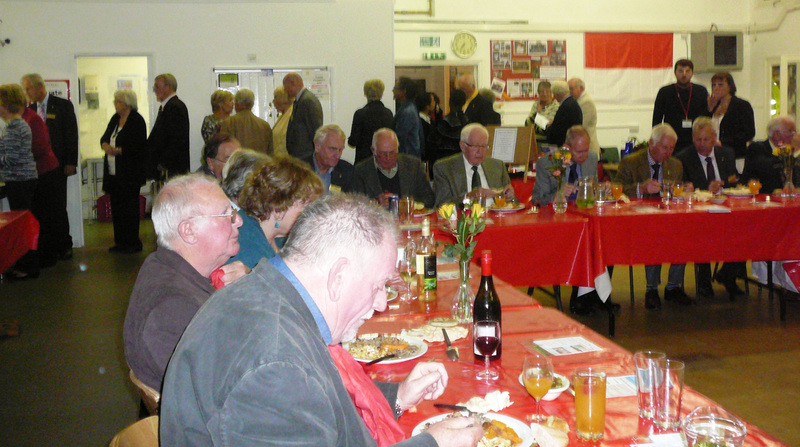 It just wouldn’t be a Rotary meeting if there wasn’t some food about – would it? In fact it is probably embedded in the thoughts of Paul Harris, somewhere, (I just have that feeling that someone out there is going to tell me!) But away from their usual haunt (The Cooden Beach Hotel) Senlac members were with their wives entertained and fed by the scholars of the Pestalozzi School at Sedlescombe. I need to tell you a bit about this school – formed shortly after the 2nd World War by one – Johann Pestalozzi – a Swiss citizen and educational theorist. In fact he proved to be highly practical. His school, which is still going strong today was set up to give a home and education for orphans and refugee children from all over the world. This mandate still continues except they are now housed by families in the locality. There are two or three from each country covered and include, Belize, Thailand, India, Nepal, and ‘Africa’. Mr. P’s strap-line is -“Head, heart and hands” to provide a fully rounded individual, and, as you may imagine, there is great competition for the available places. As well as passes in academic subjects the selectors look for – high levels of confidence and a strong personality. I seem to remember there was a Pestalozzi School Interact Club at one time, was that sponsored by Senlac Club? 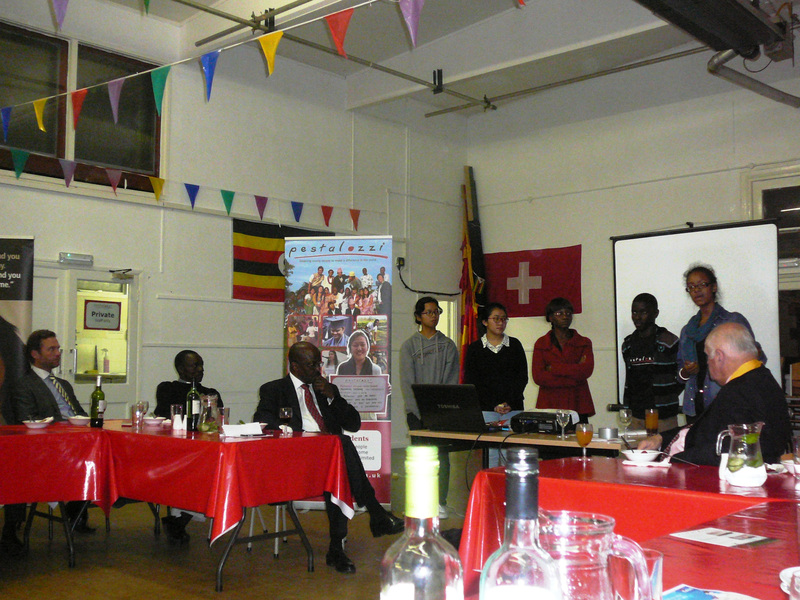 After the meal with courses from different of the above nations the students answered questions by the Senlac Rotarians. I am sure the interaction was well received by both sides, and President Christine Folley rounded off the evening with a vote of thanks. I have to say, being from another club in the area, that the Pestalozzi school has always interested me, and I should like to hear more about them too! Although taking children from their native country to give them an ‘International’ education is these days somewhat out of fashion, it strikes me with our Youth Exchange programme, that this is somewhat ‘down our alley’ too. Comments? 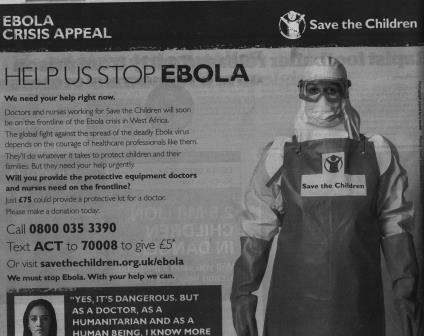 Never mind Polio……… What are WE doing about Ebola? It is not often that I use this blog site as a soap-box. And yes, you are right, as far as I l know, and I don’t know everything, but it seems to me that there is a deadly silence, and I use the words advisedly, about the Ebola epidemic and crisis in West Africa. Yes, I know that Rotary, at every level is not the fastest reacting NGO in the world. By the time that resolutions have gone through the mill at club or District level the immediate problem may well have gone away. But Rotarians, in Kent, Sussex, and South east London, we have got money, and expertise, there must be something we can do to support Rotarians we can do now. And, never one to let sleeping dogs lie. Never has a new epidemic thrown the -now rather tired – Polio campaign into such strong relief. When, oh when, are the Big Men in Rotary going to wake up with the fact that Rotary has taken the polio campaign as far as it can go! We are down to the irreducible minimum of countries who are ‘refuseniks’. Rotarians in Britain, (and probably elsewhere in Europe too) have done polio, and yes, we’re sick of being told, ‘Just one more heave’. So let’s have a good look at the different aspects of Ebola. Do they need Shelterboxes? Almost certainly – Yes. Do the people tending for orphans, and broken families need funding and help? Yes, too. And other things that Rotary is good at, working with our sister clubs in West Africa to carry on working when the news crews have long packed up and gone home. And I trust too we will get some coherent answers! Adrian’s Music Box gets Bexhill members ‘Singing for their Lives’ ! Adrian is the organist and Director of Music at Christ’s Hospital (Horsham), as well as St. Mary’s Church, Portsea. He was aware of the benefits of singing for better interaction and overcoming cultural differences by using participatory singing, but wanted to deliver a cost-effective way of delivering this to care homes and community groups. His charity is entitled aptly – ‘Sing for your Life’ and works with his Silver Song Music Box, and iPad and other tablets to bring the words and music to people with dementia, adults with special needs, and recovering stroke patients. 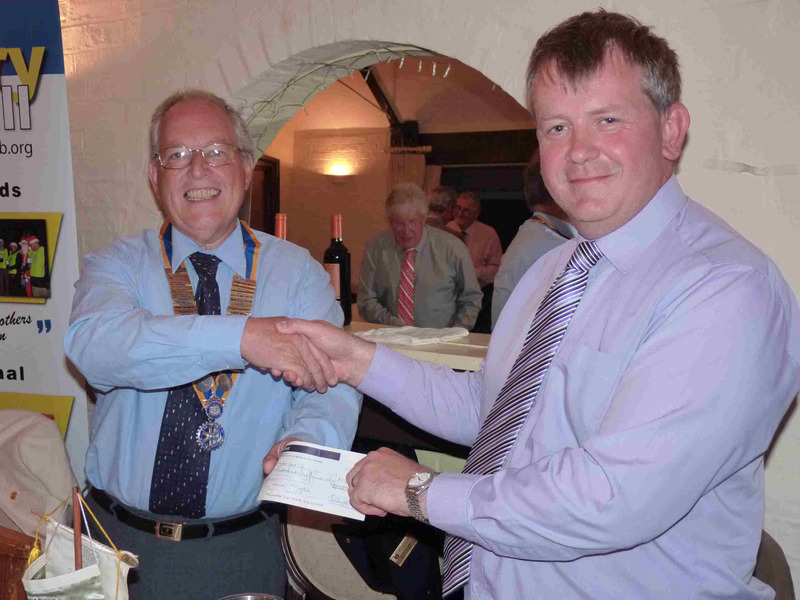 To show the club’s support – President John Coles presented Adrian with a cheque to continue the good work. 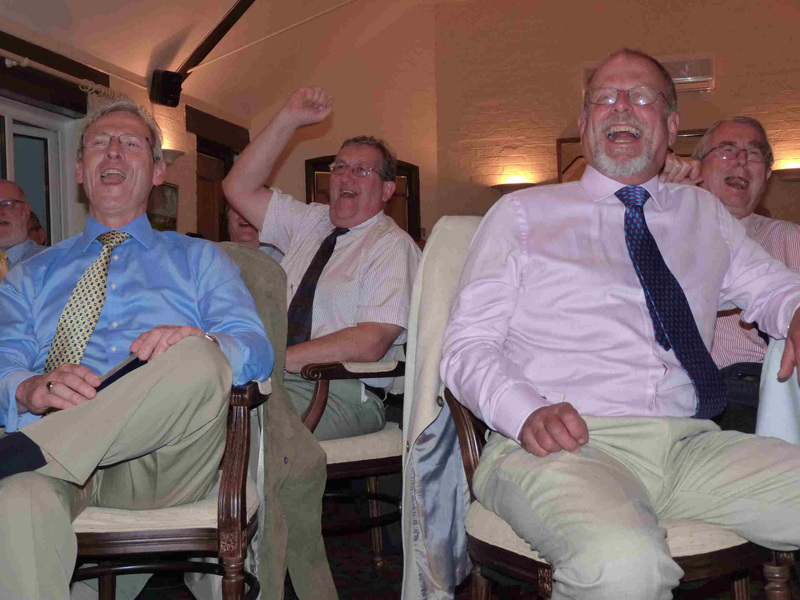 So Bexhill members went off ‘With a song in their Hearts’ (remember that Rotarians? signature tune for ‘Two Way Family Favourites’) and the web address, http://www.singforyourlife.org.uk in their pockets. Adrian Bawtree was invited to speak to the club by Bexhill member Rotarian Paul Frostik, and here he is at the meeting with the speaker. 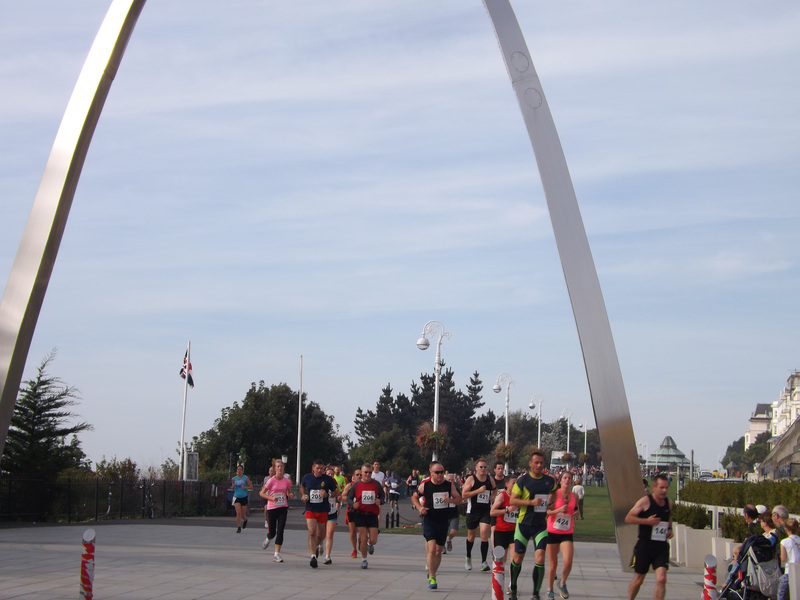 ‘Going under the arch’ means that you are one of the 580 runners who registered for the Folkestone Half Marathon last Sunday 28th. September. This is the Ninth of these marathons and they get better and better. Although largely organised by RC Folkestone, the clubs of RC Hythe, and RC Folkestone Channel also help with marshalling and feeding stations, not to mention the goody bags for everybody who takes part. I get the feeling that all the Folkestone clubs work particularly well together, and also work closely with their local council – Shepway – to make events like this one work well. They have already netted over £20K at time of going to press, and with other promises etc. hope to top last year’s £38,000. The two charities chosen this year are ‘Step Short’ and the ‘Gurkha Memorial Fund’. There was also a ‘junior race’ which is quite new, and includes child members of the Folkestone Running Club. There are several classes including prices for ‘veteran’ males of 40, 50, and 60 years, and ‘veteran’ females of 35, 45, and 55. The winner was Tom Collins of the Medway & Maidstone club, and he ran the course in a time of 1 hour 14 minutes and 29 seconds. Swim Relay Event for Children in Need – Register Your Team Now! Rotary GO Phase 3 Comes to District 1120! My Rotary – yes it is for you too! District 1120’s 1st Corporate Member Announced!! Hette Stainer – If you took a ‘selfie’ of District 1120 what would it show? What’s This? Rotary Central? Never heard of him….. You have now! 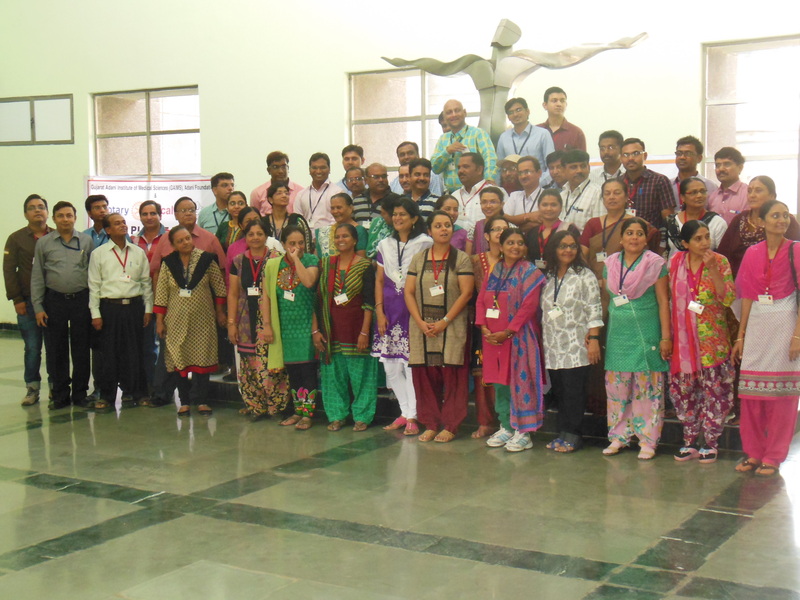 Indore – ‘Calmed’s target for 2015, not a pretty city, but glad to be chosen! 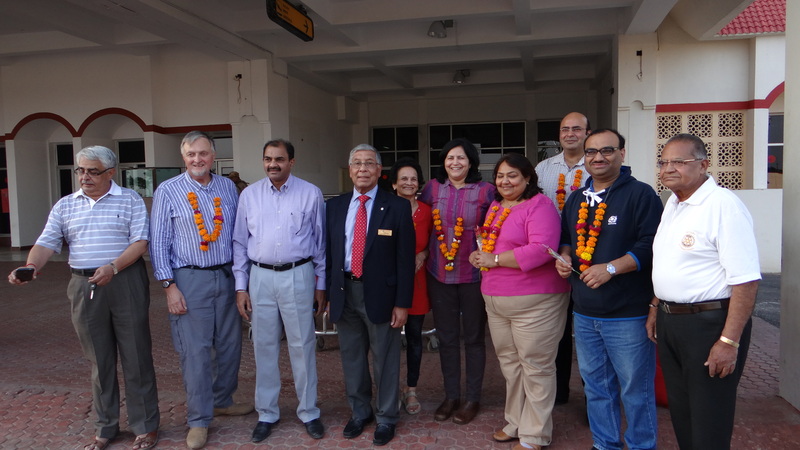 If you were waiting for ‘Rotary Day’….. Sorry, You’ve missed it! Santa plays cupid in his grotto – Maidstone Rotarian Roger Hext has seen it all! Does ‘Rotary’ always have to be about food? Senlac honour the haggis – and their stomachs! Will the real Devin D. Thorpe please stand up?